Johann W. Ritter was a German physicist born on December the 16th, 1776 in Samitz bel Haynau Silesia, now Poland. Solar Ultraviolet or UV rays make up part of the electromagnetic or photonic spectrum of light and radiant energy. Part of this spectrum is broken down into wavelengths and is measured by nanometers or nm, for short. The electromagnetic spectrum within the wavelength region ranges from the vacuum ultraviolet to the far infrared. We cannot see ultraviolet light and it is shorter in wavelength than visible light. UVA wavelengths(320-400 nm) are only slightly affected by ozone levels. Most UVA radiation is able to reach the earth's surface and can contribute to tanning, skin aging, eye damage, and immune suppresion. UVB wavelengths(280-320 nm) are strongly affected by ozone levels. 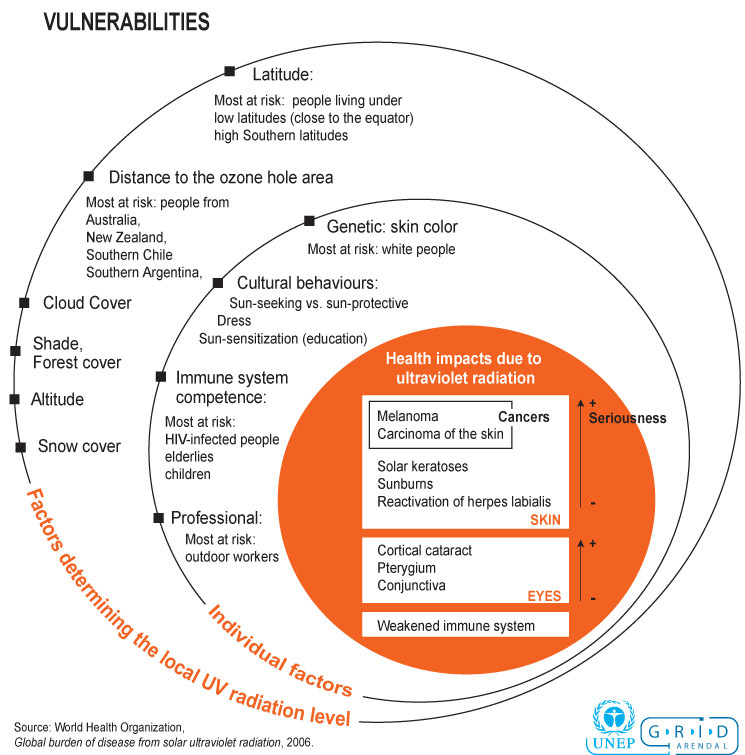 Decreases in stratospheric ozone mean that more UVB radiation can reach the earth's surface, causing sunburns, snow blindness, immune suppression, and a variety of skin problems including skin cancer and premature aging. The effects of UV radiation on earth's ecosystems are not completely understood. Even isolating the effects of UVA versus UVB is somewhat arbitrary. All UV radiation can be damaging. This knowledge has prompted many manufacturers of sun screen and sunglasses to offer products that protect against both UVA and UVB wavelengths. While humans can choose various courses of protection, for instance avoiding noon-time sun, plants and animals are not so fortunate. Studies have shown that increased UV radiation can cause significant damage, particularly to small animals and plants. Phytoplankton, fish eggs, and young plants with developing leaves are particularly susceptible to damage from overexposure to UV. Solar UV radiation levels are highest during the middle of the day. In total, almost half the daytime total UV radiation is received during the few hours around noontime. Clouds, as well as ozone, have a tremendous affect on UV radiation levels. However, cloudy skies generally do not offer significant protection from UV. Thin or scattered clouds can have minor impacts on UV and even, for a short time, increase UV above what it would be on a blue sky day by further scattering the radiation and increasing the levels that reach the surface. To determine UV ray levels an instrument capable of measuring these "invisible" rays must be used. Ultraviolet rays have their place in our ecosystem, (and it isn’t merely to provide manufacturers an opportunity to sell their sunscreens). UV rays, for example, are necessary for our body to produce vitamin D, a substance that helps strengthen bones and safeguards against diseases such as Rickets. Some scientists have shown that Vitamin D lowers the risk of getting some kinds of internal cancer, like colon cancer. UV light is also used as a therapy for psoriasis, a condition in which the skin sheds its cells too quickly, resulting in itchy, scaly patches on various parts of the body. When exposed to ultraviolet rays, the growth of the skin cells is slowed, relieving the symptoms. UV rays are also used in various commercial functions, such as disinfecting fish tanks and sterilizing medical equipment. Animal life makes their own use of these wavelengths too—certain animals can actually see ultraviolet light, and use it to their advantage. Bees use the reflection of UV off of flower petals to guide their pollen collecting. Though ultraviolet rays do have a purpose, one must not use this information as a validation for their sunbathing habits. The dangers of UV exposure are real, and public ignorance concerning these matters could lead to increased health problems in the future. One of the most common effects of UV exposure is "erythema", also known as sunburn. Sunburn occurs when skin cells are damaged by the absorption of energy from UV rays. To compensate for this injury, the skin sends extra blood to the damaged skin in an attempt to repair it—thus accounting for the redness that is associated with sunburn. The amount of time it takes for a sunburn to occur is dependent mostly on the relative amounts of UV rays that are hitting the skin, and on a person’s skin type. People with naturally dark skin already have inherently high levels of melanin, and so are able to spend a longer amount of time in the sun before burning, if they burn at all. Fair-skinned people don’t have it quite so easy—burning can occur within a relatively short amount of time. Another effect of ultraviolet rays on the skin is photoaging. Recent studies have shown that many of the symptoms commonly associated with mere aging (i.e. wrinkles, loosening of the skin) may instead be related to UV exposure—so though your tan may look good now, you could be paying your dues in wrinkles later. In order to inform the public about the intensity of UV radiation the UV Index was invented and is now published in newspapers and on TV. The definition of the UV Index is the same throughout the world, so it's a great way to learn about the UV hazards at your travel destinations. The Index is a simple number. 1-3 means low exposure; 4-6 means medium; 7-9 means high; and more than 10 means extreme exposure. The time you can stay outside in the sun at a given UV Index depends also on on your skin type. For example, if you have fair skin (Skin type I) and the UV Index is seven, it takes less than 20 minutes until your skins starts to redden. If you have a dark skin color the same UV level may need more than 40 minutes to cause an effect. A common misconception among the public is that if the damage isn’t visible, no damage has been done. The only way to dispute this is to observe the long term effects of a stimulus. One of these effects has been identified to be skin cancer. The American Cancer Society has predicted that in the year 2001, approximately one million new cases of non-melanoma type skin cancers will be diagnosed, along with an additional 51,400 melanoma cases. It is also predicted that in this same year, 7,800 people will die from melanoma, and 2,000 people will die from other skin cancers (i.e. squamous and basal cell carcinoma). What is the significance of this? Skin cancer rates have been on the rise in the United States since the 1970’s, with melanoma incidences increasing at a rate of 6% a year until 1981. Since then, the melanoma incidence rate has increased steadily at a 3% increase a year. (Statistics taken from The American Cancer Society Statistics Page at www.cancer.org) These increasing rates mean that the threat of cancer has become a personal issue to the average American. Luckily, it is believed that the causes of the majority of skin cancers have been identified—ultraviolet radiation. There are three basic types of skin cancer: melanoma, basal cell carcinoma, and squamous cell carcinoma. Basal and squamous cell carcinoma make up the most common and less dangerous forms, called non-melanoma cancers. It is believed that ultraviolet rays (specifically UV-B) are one of the chief causes in these two cancers. In order to understand why, it is helpful to know that cancers occur when mutated or damaged cells in the body begin to divide and invade other areas, forcing out the healthy cells and tissues. In the case of skin cancer, the ultraviolet rays from the sun are usually the instigator. Researchers whose work is specifically geared towards squamous and basal cancers have isolated the gene suspected of being mutated, namely the p53 gene. Under normal circumstances, this gene works against cancerous tumors, inhibiting the division of cells that have been mutated or damaged. If the cell cannot be repaired, the p53 gene induces the cell to destroy itself, or commit “cellular suicide”, so that its mistakes cannot be passed on to another cell during division. If the p53 gene is mutated, however, (for example through UV-B rays) then it will prohibit a damaged cell from committing suicide, thus leaving it available to divide as normal. The damaged cells then begin to replace the healthy cells, and the condition known as cancer is developed. These types of cancers, though common, are not usually fatal, as they rarely metastasize (extend to other parts of the body). The causes of malignant melanoma are much less defined. Some suspect that there is a relationship between UV exposure and melanoma rates, but there are varying theories. Some scientists have developed a theory that UV-A radiation is much more effective in causing melanoma than assumed previously. If this were the case, then many sunscreens currently available offer only very little protection against melanoma, as they mostly block UV-B, and not UV-A. This would be a possible explanation for the observed trend in melanoma cases, where incidences are more prevalent among the fair-skinned population who use sunscreen than among the darker skinned, or even among the fair-skinned who don’t use sunscreen. An explanation for this lies in the nature of sunscreen—it blocks the UV-B rays that cause sunburn, thus allowing those of fair skin to stay outside for longer amounts of time and still feel "safe". Instead, they are exposing themselves to greater quantities of UV-A rays, which could be increasing their risk of melanoma. The danger to sunscreen could also be two-fold—not only does it persuade people to stay in the sun longer, but habitual sunscreen users tend to lack tans, which is the body’s natural protection against both UV-A and UV-B. This allows even more UV-A to penetrate the skin. The moral to this story? Don't rely exclusively on sunscreens as your UV protection. Block also UV-A radiation by wearing hats and appropriate clothing. A—Asymmetry. Does one half of the mole look like the other? B—Border Irregularity. Are the edges smooth and regular, or are they crooked? C—Color. Is the color uneven? D—Diameter. Is it larger than one cm? Moles that develop later in life should also be a source of concern. Most benign moles have been present since childhood. However, it is possible for childhood moles to become malignant. Because of this, changes in the appearance of any mole should be noted. Australians suffer the highest rates of skin cancer in the world. Each year, around 1,200 Australians die from what is an almost totally preventable disease. Everyone can develop skin cancer; however, some people may be at higher risk than others, due to a range of factors. Ultraviolet (UV) radiation levels in Australia are higher than in Europe, even during summer. Being located close to the ozone hole over the Antarctic means much higher, more severe levels of UV radiation get through to ground level. During summer, the earth's orbit brings Australia closer to the sun than Europe during its summer, resulting in an additional seven per cent solar UV intensity. This, coupled with our clearer atmospheric conditions, means Australians are exposed to up to 15 per cent more UV than Europeans. SunSmart adopted its name and mission in 1988. An initiative of The Cancer Council Victoria and supported by the Victorian Health Promotion Foundation, SunSmart was developed to combat spiralling skin cancer incidence and mortality rates. Since then, attitudes towards tanning and sun protection have changed dramatically. Australians have realised the pitfalls of their sun-loving, outdoor lifestyle and are taking preventative measures to reduce their risk of sun damage and skin cancer. Research by The Cancer Council Victoria shows SunSmart’s messages have reached a majority of Australians and had a stong impact on their behaviour. Consequently, skin cancer deaths have slowed and for females, have even started to decline. More Australians are detecting skin cancers early, increasing their chances of surviving the disease. Ultraviolet rays can be reflected towards the eyes by certain substances, such as sand and snow. When this happens, the amount of UV rays the eyes are exposed to is increased. This fact is the basis of the condition photokeratitis, also known as snow blindness. Photokeratitis is a sunburn of the cornea, and usually recedes within one to two days. It occurs when the eyes are exposed to large quantities of UV light in a short amount of time. The reflection of UV rays off of snow and sand are enough to incur this injury. It is more difficult to isolate the exact amount of damage that UV imposes on the eye over a long period of time, as the body has its own built-in defense against harmful rays. If you were to try to look up at the sun, you would find that you would not be able to do so for any length of time. Your eyes would naturally start to close. This effect is also noticed on especially bright days, displayed in the form of squinting. What is known, however, is that cumulative exposure to UV rays is one of the causes of opacity of the eye's lens, called cataract, a condition that displays itself primarily in elderly people, and results in blurred and fuzzy vision. Even though some species respond positively, extensive tests in several countries have shown that hundreds of species of plants and animals display negative effects from an increase in UV radiation. Another issue that may seem more relevant to the human population is the effect of UV on plants and food crops. Greater exposure of plant life to UV-B can result in a decrease in production rates, meaning less food available world-wide. Throughout the world efforts are being made to increase the level of UV resistance in staple crops, such as rice, where some species are extremely sensitive to UV radiation, and other species of rice can withstand a great increase. With this knowledge, scientists can find the most effective and economical species to use in rice farming, thereby increasing the UV resistance of much of the world's food supply.